Talk to the envelope printing experts! 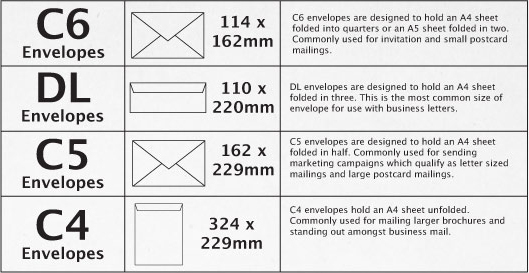 Printing Envelopes offer far, far more choice than the standard envelope sizes. Call us now for details on envelopes from 89x152 mm right up to giant C3+ full colour printed envelopes 444x368mm. Wallet, pocket, square, vibrant, pastel, metallic, tinted WE DO THEM ALL! POCKET OR WALLED OR BOTH?? A pocket differs as the flap appears on the short edge. A wallet envelope has the flap on the long edge and is used for mechanical mail insertion. A banker has a triangular shape flap and is traditionally used for greetings cards and invitations. Get your business noticed with our eye catching overprinted envelopes. Ask for a price today, you'll be amazed what great value they are.